Photo above: Karen Smith, MD, with a patient. Editors’ Note: This article is an excerpt from the Office of the National Coordinator for Health Information Technology’s report Health IT Impact on Quality: Stories from the Field. 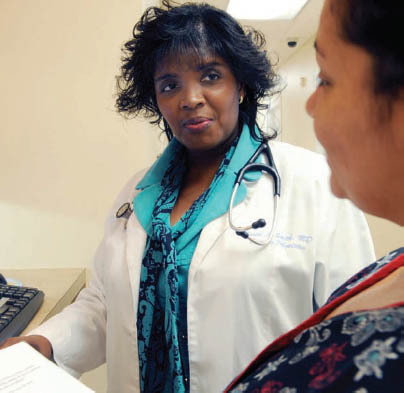 Karen Smith, MD, is the only physician in her family medicine practice in rural Raeford, North Carolina. But by making the most of her electronic health record (EHR), she’s produced significant improvements in heart health measures across a broad swath of her patient population. As a participant in the national Million Hearts initiative, a campaign launched by the U.S. Department of Health and Human Services in 2011 to prevent one million heart attacks and strokes by 2017, Dr. Smith has seen an overall trend of improving heart-related outcomes for her patients compared to an initial baseline assessment in 2011. September 2013 data shows that Dr. Smith’s practice achieved a tobacco cessation rate of 92.65 percent, far exceeding the Million Hearts goal of 70 percent. Another measure headed in the positive direction is the LDL cholesterol rate, which is trending up from below 30 percent in April 2013 to 57.81 percent in September 2013. Preliminary January 2014 data for blood pressure control rate show Dr. Smith’s practice inching past the Million Hearts goal of 70.59 percent. The local Regional Extension Center, the North Carolina Area Health Education Center (AHEC), played a major role in helping Dr. Smith’s practice launch her work under the ambitious Million Hearts campaign. One-on-one meetings with a nurse or affiliated clinician to talk about barriers standing in their way and preventing them from achieving the good health they want. Group visits with other patients, often using the “motivational interviewing” style of counseling that helps individuals identify and resolve ambivalent feelings in order to achieve a change in behavior. Use of external resources already available in the community to support patients in their journey toward better health. One of the many patients who benefited from this effort was Donald Jones, an Army veteran and retired teacher who had a history of heart issues and was then diagnosed with Type 2 diabetes. Dr. Smith noted that by controlling Jones’ diabetes, they were able to greatly reduce his risk for cardiovascular disease. She credits the EHR with giving her the capability to have this kind of impact, not just with patients on an individual level but also in managing the health of all her patients at risk for cardiovascular problems.